The struggle to establish the truth about what happened is a long one and is not yet finished. Defend the Right to Protest welcomes the news that the injustice suffered by student protesters Christopher and Andrew Hilliard can at last be made public with full recognition from the Met. This success is the result of a hard fought campaign in which the victims of an assault had to assert their innocence and clear their records. 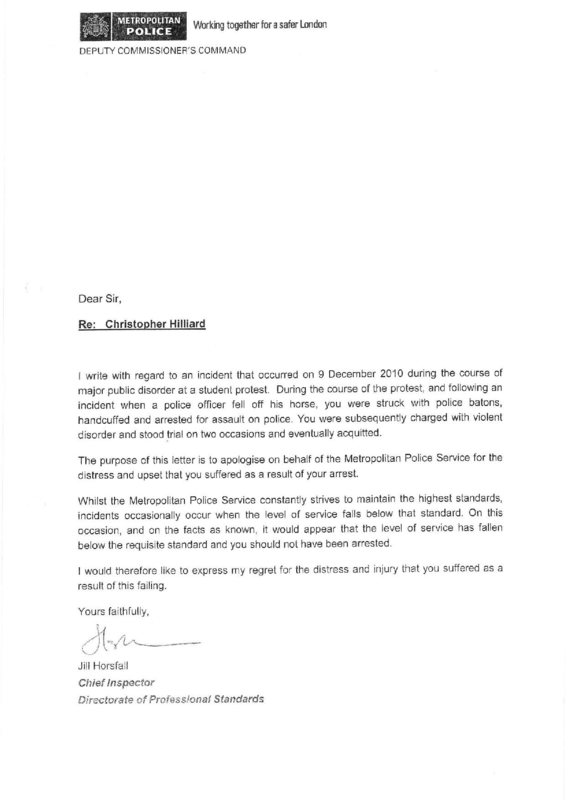 It occurred in the context of the Prime Minister calling for protesters to feel “full force of the law” after police officers had been “dragged off police horses and beaten” – an incident that it has been admitted did not happen. In the case of the Hilliard’s, a jury unanimously rejected the testimony of nine police officers. All had alleged they witnessed the officer being unseated, but not the assaults Cowling carried out on both brothers. With this win, the true story of the student protests moves a step closer to replacing a media fiction. PC Ott was jailed in May this year for knocking out a student protester’s tooth during the same protest. 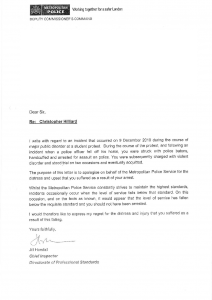 The student in question, William Horner was also arrested after the assault on suspicion of criminal damage – although charges were not pursued. Another student protester Alfie Meadows was cleared of violent disorder at the same protest over two years ago, yet still awaits the release of the IPCC report into a brain injury that required emergency surgery. One doctor who gave evidence in Alfie’s trial recalled “the vast majority of injuries I saw were head injuries, I was surprised how much force the police used”. The Met’s own records show the vast majority of those injured on the day were protesters (67) rather than police (22). The struggle to establish the truth about what happened is a long one and is not yet finished. Up until now it has relied on the dedicated efforts of a small number of protesters seeking to clear their names. 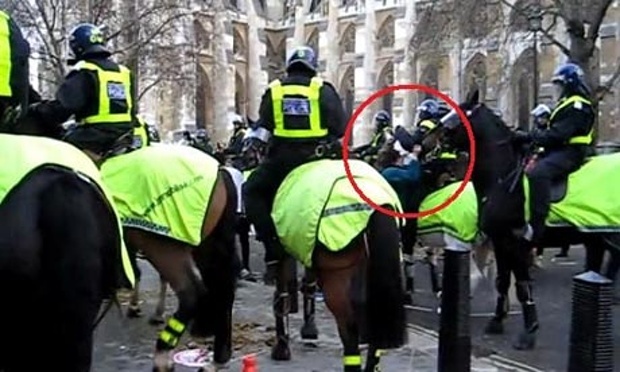 We believe it is in the public interest that a public inquiry takes place into the violent police tactics on 9th December, which included the use of horse charges, baton strikes and containment that resulted in what one witness described as a ‘Hillsborough like crush’ on Westminster Bridge. However we believe the public inquiry needs to also consider the tactics of collusion between police officers which have been evidenced in prosecutions and civil matters arising out of 9th December 2010. There is an enough evidence for an inquiry to scrutinise police officers collaborating and fabricating evidence in order to potentially send innocent people, some who had been victims of police violence, to prison for lengthy custodial sentences. The Hilliards will also be speaking about their experiences at Defend the Right to Protest’s National Conference “policing the crisis”. For more info/to register check out our eventbrite page. That’s a so called apology? Nothing to say that the police wrongly arrested them? Or that they apologise for assaulting them? What a crock of s***!